Diving a little deeper into Q3 performance, large cap stocks outperformed small cap, and growth stocks (once again) outperformed value stocks, and each did well relative to other asset classes. 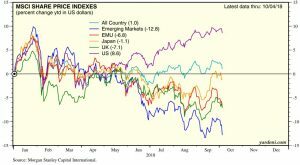 International markets rebounded for the most part, but still lag for the year, particularly emerging markets like China and Brazil. REITs had a negative quarter (if you do not consider the dividends), and bonds were flat as well. Both of those are attributed to the rise in interest rates. As far as US market sectors, performance was stronger in healthcare and industrials (which is transportation, aerospace, machinery, etc). The 10-year bond closed at 3.06%, which was steadily higher for the quarter. The price of oil dipped but recovered, as WTI crude oil closed at $73.25 (flat for the quarter, up for the year). Click here to view a comprehensive list of index returns. Looking through all the noise of news headlines and other events, corporate earnings were stellar and mostly responsible for the quarter’s gains. Many stocks posted stronger-than-expected results in the S&P 500. Many analysts say the recent corporate tax cuts are sparking this growth. Although tempting, I always encourage investors to not “chase performance”. Just because one sector does well in a particular time period, one should not think it wise to sell the underperforming sector in favor of the outperforming sector. What does poorly in one time period can (and often does) do better in the next period. Picking a single year’s winner is not easy, and I don’t encourage others to try it! Staying the course and rebalancing on occasion is what I typically recommend. As per usual, investors will be watching a wall of worry in the news between now and December 31. In addition to lingering trade tensions, high energy costs, and potentially another rate hike, there will also be uncertainty amid the hotly anticipated mid-term elections. There will be no shortage of fear that the media will put out there, and if someone sounds smart and wants media attention – it’s better to be a pessimist. Let’s be honest, I don’t think the general public wants to hear about how much more the market will run… but tell them about the pending doom-and-gloom and the networks will have people clinging to every word! One final comment: before we get into end-of-year holidays, now would be a good time to address some financial planning issues. Most common is reviewing your 401k to see if you have maximized your contributions (or are about to) and adjust accordingly. You should also be evaluating the status of your RMD, any potential Roth conversion opportunities, and anything related to your cash flow and budget. I’m always available to go through these things with you.